I first heard of joints dipped in embalming fluid on an episode of my favorite series of all time, Six Feet Under. Known as "sherm," "fry," "amp," "illy," "wet," "wack," or "dank," the dipping of the marijuana is said to intensify the high. 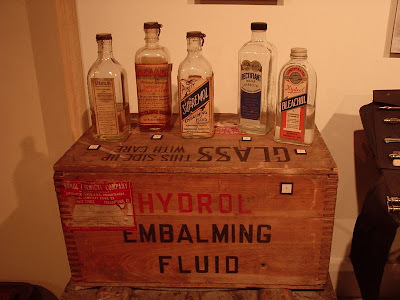 In fact, the joints are not dipped in embalming fluid, but in a liquid containing PCP - which is referred to in slang as "embalming fluid" because the drug's numbing effects leave the user feeling "embalmed" or "dead." This point of confusion has led to the use of actual embalming fluid which, if purchased on the street, contains PCP. The use of both embalming chemicals and PCP (phencyclidine) are bad ideas. Smoking formaldehyde-based embalming fluid - a known carcinogen - can lead in the short term to headaches and nausea, and in the long term damage to the throat and lungs, including bronchitis, emphysema, and even cancer. Smoking PCP - originally devised as a surgical anesthesia - leads in small doses to numbness, euphoria, intoxication, hallucinations, dissociative states, anger, and addiction, and in large doses (above 20mg) can cause psychosis, brain damage, coma, and even death. One article about smoking embalming fluid and/or PCP references a case in 2000 in which a 14-year-old stabbed a person to death. And a paper on the subject explains the production, procurement, and use of these so-called $10-20 "happy sticks" by adolescents since the 1970s and suggests a tighter control on the legal purchase of formaldehyde. Isn't that what caused Helen Hunt to jump out the window in that 1982 made-for-tv movie titled 'Desperate Lives'? Didn't we all learn from this? Guess not. BTW - I love Six Feet Under, and have started watching the entire series from the beginning. I am in the middle of Season 2, and it is just as good the second time around.